← Does it Matter If They Sank Without A Trace? 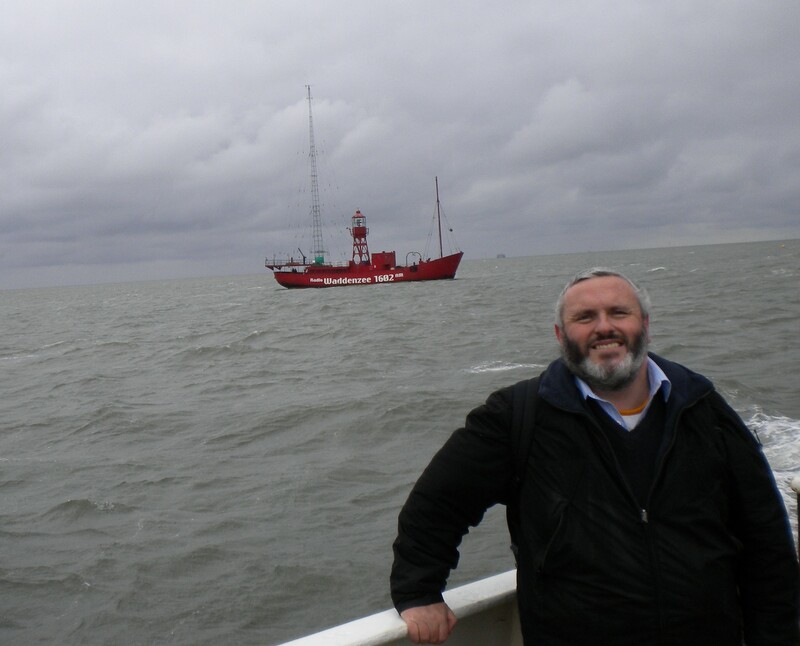 Every Saturday from 0600 to 0800 and again at 1800-2000 GMT (or an hour later if you are in Central European Timezone) I present a two-hour rock and indie show on Radio Seagull, an English-language station based in Northern Holland, which can be heard locally on 1602 AM, or globally via the Seagull website. Once a year, usually in early summer, Seagull puts to sea in its lightship the Jenni Baynton, and the crew of broadcasters and engineers live and work together for a period of weeks, but for the rest of the year I prepare and present the shows from my own studio in Dublin, and link across to the Seagull transmitter through a fast broadband connection. 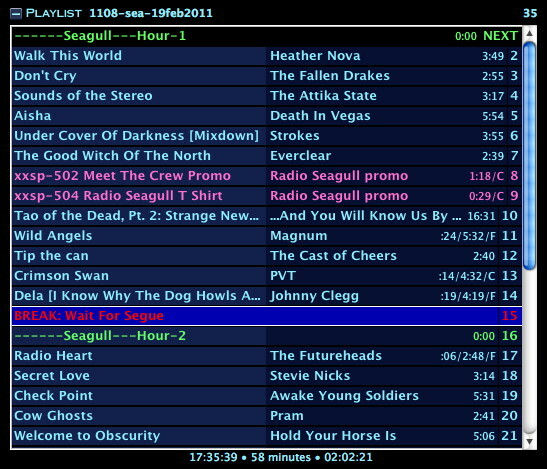 The joy of Seagull is that within the parameter of being broadly a rock station, it is entirely free format, so I have 100% free choice in what I choose to play, and how I structure the show each week. As long as I include a couple of scheduled adverts/promos, and time correctly to let the local studio in The Netherlands insert an ad-break at the top of the hour, the show is absolutely my own to do with as i please. If I want to play an ultra-long prog-rock track, I can, if I want to put a softer pop tune inbetween some new rock releases I do, and no one will query my judgement. There is no need to “play safe” so I can goas far down the road of new releases from little-known bands as I like. Or I can theme the show on a whim if I want. Seagull works on the principle of using presenters who are passionate about what they do, and trusts them totally. It’s a heady freedom, and I love it. Working free-format is a breeze if you are doing a one-off, but can be more demanding if you are doing a show every week – avoiding the trap of going down the same routes too often, keeping it fresh, and knowing when and where you have played something before. Thankfully technology makes this so much easier these days, but even so, I probably spend about 5 hours – an entire evening each week – preparing the Saturday shows. It’s always worth it though. A few people have asked about Seagull and what we play, and others about the mechanics of it, so i thought a quick walk-through of how I prepare a show, and the finished playlist would be fun to write and put up. 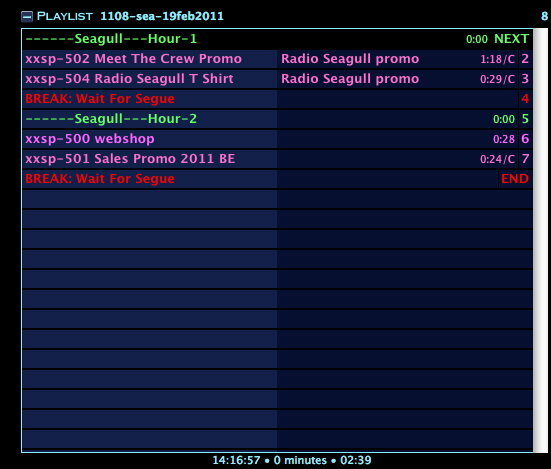 So here is my Seagull show for Saturday 19th February 2011, from blank page to finished playlist. I use a wonderful piece of software called MegaSeg to manage my personal music library, put together playlists, and act as a ‘virtual studio” when I am presenting the shows. I purchased this rather than using one of the various shareware packages that are around because of its depth of features – you could run a complete radio station via MegaSeg if you needed to, and I find that it has paid for itself several times over in the ease of access it gives me to store and search my music, and the flexibility it allows me in building and presenting a show. 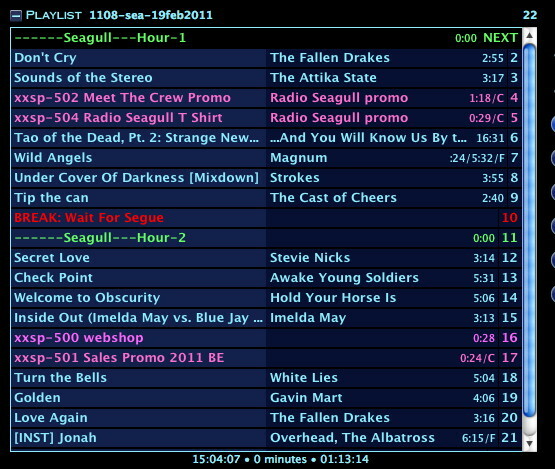 MegaSeg playlist window, starting off with just the adverts I need to play. In the screenshot above, I’ve added in markers to indicate the two hours of the show, and the couple of promos that need to be played in each. At the bottom is shows me the total running time of the current playlist (2 mins 39 secs ). The first thing I will do will be to select and put in all of the new music that I am going to feature in the show. I generally like to have about 50% of the content of the show being brand new or very recent material. Again, there is no specific rule for this on Seagull – I am free to use as much or as little new music as I like, the 50ish 5 is my own personal preference, based on the fact that I enjoy discovering and sharing new sounds, and that having a high content of new material is one way of keeping a free-format show sounding fresh month after month. OK, so in the shot above, I have now added in my new music content, and the playlist comes to 1 hour 13 mins, so probably around 60% or so on this occasion. From the current timestamp (the number bottom left) compared to the previous shot, you will see that it has taken around an hour for me to settle on the blend of new tracks I’ll be playing today. Most of these will be very new (just out, or possibly pre release), some will be from within the last 2-3 months, and a couple may possibly be older, but from a newly released album or compilation. At this point, the tracks are not in a specific order, I have just placed them into the playlist roughly equally distributed between the two hours. I’ll know better what running order I want once I’ve added the other material. I do however know that I want the 16 minute Trail of Dead track, “Tao of the Dead Pt. 2” to come out of the ad break in the first hour, so I’ve put it in place there. These tracks are a mixture of album and EP tracks, with the odd single. Usually each week there is one album or EP which I have just bought, and I will feature two tracks from, one per hour – this week it is The Fallen Drakes. In the shot above we are looking at the Library window, which allows me to choose from the roughly 10,000 tracks I have available (including jingles, promos, adverts as well as music). MegaSeg has a very powerful search function which is instant as you type in the words to be searched for, or you can view the entire library listed by Artist, by Album, by Song Title, by duration, by Genre, or by Date Added (the latter being useful for isolating the newest material). In this view above, we are looking at the library by duration – this is very useful when you need to complete a playlist to time exactly to the finish of an hour, and need, for example, a choice of all the tracks that are 5 mins 43 in duration, as seen here. 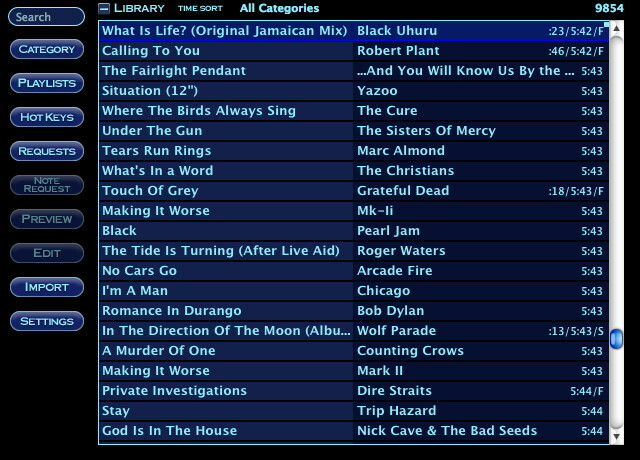 I also use the view-by-duration as a good way of randomising the library when i am picking older tracks to play – whereas when viewing by album or artist your eye might be drawn to better known tracks, if you pick a randon time on the list and scroll up or down from it, you will quite often pick up a good collection of varied tracks that might not have lept out at you in the more ordered view. I have now added enough older material to fill out the the remaining 47 minutes (and it’s taken me a bit more than two hours just to make those choices!). The total playlist length is now 2 hours, 2 mins and 21 seconds – slightly over-long, but that will get cut down shortly. It’s still not neccessarily in the final order though, but I’ve made sure to choose the start track in each hour carefully – I like to have something reasonably strong, and not too quiet to start off the hour. You will notice that whereas some of the songs have just a duration, others have more info – for example “Wild Angels” by Magnum says :24/5:32/F. This means that the intro on the song is 24 seconds before vocals start, it is 5 mins 32 long, and ends with a gradual fade (the other options are “C” for a “Cold” or sudden ending, and “S” for “Sustain” when it ends on a drawn out note or flourish). I will need to go through and set this on the other tracks in the playlist – once I have done this, the library will remember this information, so I’l never have to do it again for that track. In the picture above I am editing the details for Heather Nova’s “Walk This World”. Setting the intro length is handy, but setting the endpoint is essential. 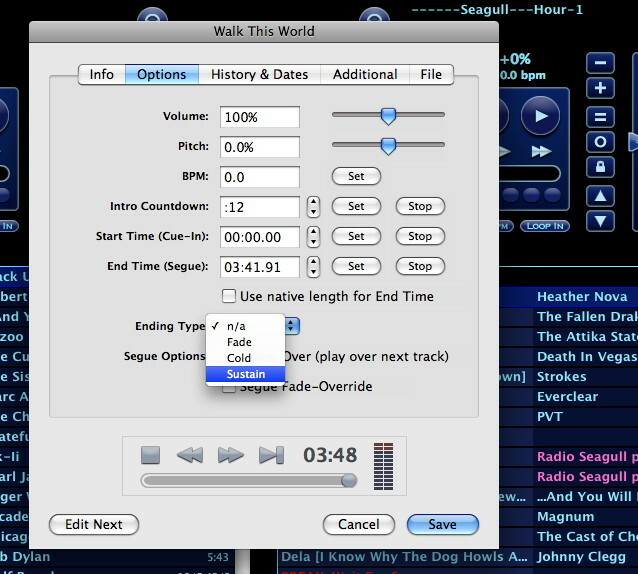 Almost all commercial CD releases of music include a couple of seconds of silence after the end of the track, sometimes as much as 4 or 5 seconds, and it is important to tell the system the exact point at which you wish it to cut to the next track if you are to avoid gaps. Similarly, it is occasionally neccessary to set a start point a second or two into the recording if it starts with silence – this is especially a problem with non-commercial and demo CDs from bands. You also have a drop-down menu for recording the ending type. Going through and doing this for each track on the playlist will usually take another hour. As the system stores these settings, gradually more and more of my library will be already done, but I’ll always have to edit the details on the new arrivals. Here is the playlist somewhat later – all track details now recorded, and endpoints set – note this has knocked a full 2 minutes of the duration of the playlist – that’s a lot of little silences! I have also put in a couple of jingles (will drop in more when I’m actually presenting), plus there are some spots marked “BREAK: Wait for Segue“. This is where I have commanded the system to stop, and wait for me to manually restart it – this is for places where I want to speak for a bit longer, and won’t be using the song intro, and also for the end of the hour, where the studio in The Netherlands will insert an ad break at the top of the hour. All of this, which has taken probably around 3 hours or more, can be done at any stage, several days in advance of the show if neccessary. All I need to do at this point is save the playlist (which I’ve been doing regularly as i built it of course) and it is ready to be called up when it is time to do the show. Almost always i will make odd adjustments on the spot as I am going through the show, and the odd song will be changed as the whim, or the mood of the music inspires me to a new choice. And usually one or two tracks will end up being dropped in the end, as the speech bits in the BREAK segments take up some time. In the end, I always re-save after finishing the show, so that I have a record of what was played, which can be useful to check back on. 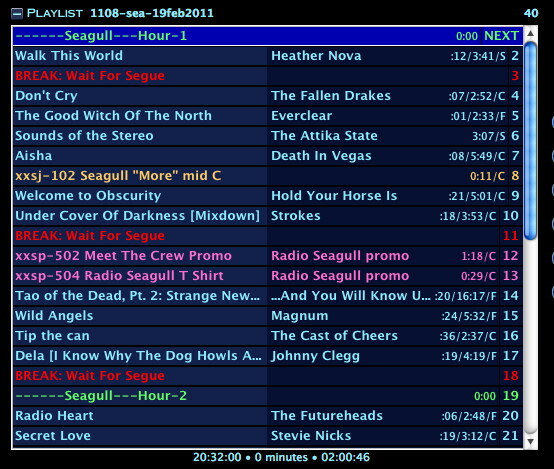 Mega-Seg can also output the playlist as a PDF, so here is the final version of todays Seagull show, so you can see the entire list that we couldn’t fit in the screenshots. So there we have one of my Seagull Saturday shows, from conception through to transmission. If you enjoyed reading this, why not give it a listen some Saturday?